Journalist Teicholz combs the science, or lack thereof, to learn how the fats in the American diet grew horns and cloven hooves. “Almost nothing we commonly believe today about fats generally and saturated fats in particular appears, upon close examination, to be accurate,” writes the author. Appallingly, those are still fighting words when it comes to the mandarins who fashion our national health agenda, those crazy pyramids that flip on their heads now and again like the magnetic poles. Like a bloodhound, Teicholz tracks the process by which a hypothesis morphs into truth without the benefit of supporting data. The author explores how research dollars are spent to entrench the dogma, to defend it like an article of faith while burying its many weaknesses and contradictory test results. In this instance, Teicholz zeroes in on the worries over skyrocketing heart-disease figures in the 1950s. Some (flawed) epidemiological work suggested that serum cholesterol deposited plaque in arteries, leading to coronary disease. This type of associative simplicity is that spoonful of sugar: the easy fix everyone wants when long-term, clinical tests are needed to appreciate the complex processes involved. This desire to corner the bogeyman targeted the world of fats, and it has stayed that way despite all the evidence and advancements in medical science, especially endocrinological studies, that have pointed to other biomarkers. Galling, though hardly unexpected, is the role played by money and the power we let it bestow. There were reasons the food industry wanted to stick with trans fats as opposed to saturated fats, and Teicholz tics them off, and there are reasons that the next great hope, vegetable oils, have dangerous health issues hidden instead of heralded. 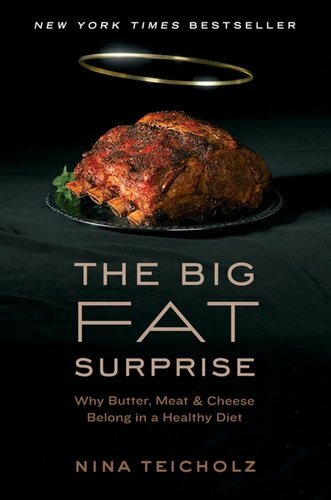 Sixty years after the fat attack, “a significant body of clinical trials over the past decade has demonstrated the absence of any negative effect of saturated fat on heart disease, obesity, or diabetes.” Solid, well-reported science in the Gary Taubes mold.